It’s always fun, and worthy of a quick double-take, when the App Store gets its knickers in a twist. This afternoon it had a brief senior moment on my iPad 2. 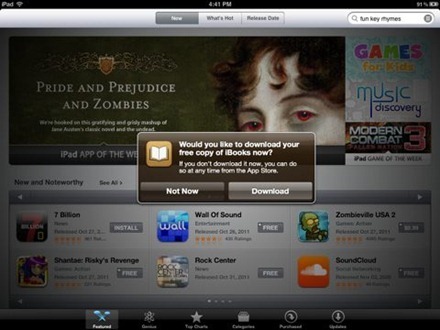 When I went to look at something in the Featured section it asked whether I’d like to download my free copy of the iBooks app. That’d be the iBooks app that has been installed on this iPad 2 since the day I got it back in March. The one I’ve been reading the Steve Jobs authorized biography on, so iBooks is nearly always in the multitasking bar. I politely declined and then also noticed that my Updates tab was suddenly showing zero updates available. There had been 30 just minutes before and I’d done no updating today. Quitting the app and relaunching it cleared its head and the 30 updates were showing again. If you’ve got any nice App Store senior moment screencaps, or similar from other apps, I’d love to see them. Please share a link in the comments or send ‘em into us via the contact AT ipadinsight.com email address. Actually, I’m in an extended senior moment with my app store. It hasn’t shown updates available for over a week. The updates tab on the App Store just goes blank – it doesn’t say no updates available like it normally does when there actually are no updates available. I just today happened to be surfing the app store and found some apps I could manually update, but there is still nothing listed on the updates tab. So far the apple store hasn’t been able to help…any suggestions?